We have received an appeal from Richard Moore in Cornwall for any information anyone can provide about this Great War Commemorative Mug which he found whilst clearing his parents’ house. It seems to have originated in Dunstable. 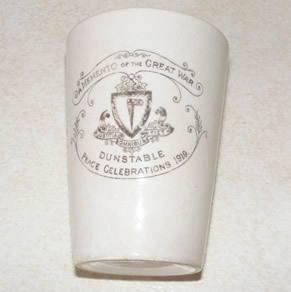 Pictured below, it is inscribed ‘Dunstable Peace Celebrations 1919’ with what he assumes to be the Town Crest. 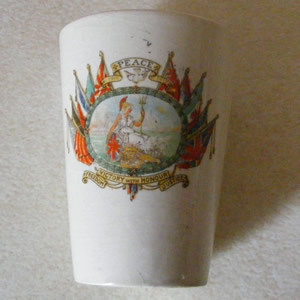 The other side has Britannia amidst a range of flags and ‘Victory with Honour, Freedom, Justice.’ It has no handle so should perhaps be termed a beaker. He supposes it belonged to his father who was born in Dunstable.